Comparison between the R-Rated and the Unrated version. Trashy but very entertaining party-splatter which is a mixture between a women's prison movie and a zombie flick. 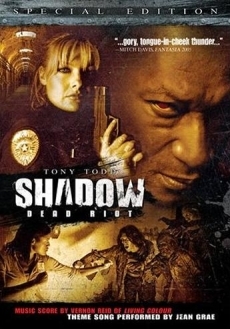 The part of Shadow is played by none other than Tony "Candyman" Todd. The other actors and actresses are relatively unknown but still do a pretty good job. In the USA both an R-rated and an uncut Unrated version can be purchased on DVD. But against the common trend, it is not mostly story extensions that lead to the version being Unrated but it is actually mostly cuts of splatter scenes. So look out for the rating when buying the movie! R-Rated version = 89:58 min. Unrated version = 91:27 min. Pure cut length = 27,8 sec. 00:00 The logo of the production company FEVER DREAMS is also present in the R-Rated version. But only as an additional title before the movie. In the Unrated version, however, the movie begins right after it, without any delay. 39:29 When the zombified Mondo piles the knobkerrie into the guard's mouth the shot showing the man from the back is longer in the Unrated version. We still see the knobkerrie leaving the back of his head. 65:16 After Elsa Thorne, the prison guard, shot the head off the female zombie a shot from above is missing in the R-Rated version. We see the corpse lying on the ground covered with blood. A zombie is entering the frame from the left. 67:13 The shot that shows Dr. Swann grabbing his throat and plenty of blood running through his fingers is a little longer. 70:26 When Rage's guts are being teared out by the zombie a short shot is missing. 70:36 Close up of Rage's bowel hanging out. She tries to push it back into her stomach (Beginning of the shot). 76:20 Close up of Shadow drinking the blood gushing out of the woman's head. Then a shot of her with blood running over her face. 80:03 Close up of the zombie-baby with a piece of Emily's bitten off breast flesh in its mouth. 80:04 Close up of the bloody breast and then a shot from a little further away. 80:07 Beginning of the shot of Emily touching her eroded breast. 80:11 Shot her still holding her breast and blood running through her fingers. 80:19 Same here. But this time also with breast milk running through her fingers. 80:20 Distanced shot of Emily. 89:39 After the end credits the R-Rated version has a note from the producers of the DVD (without music). The Unrated version shows the DVD production credits with music, matching the end credits, additionally it also contains the speakers of the Spanish version.